Recently, I’ve been doing some work with AerospikeDB. It is a super-fast in-memory NoSQL Database. I gave a presentation at the recent BigDataCampLA on ‘Bleeding Edge Databases’ and included it because of impressive benchmarks, such as 1 Million TPS (read-only workload) PER SERVER and 40K TPS (read-write) on that same server. 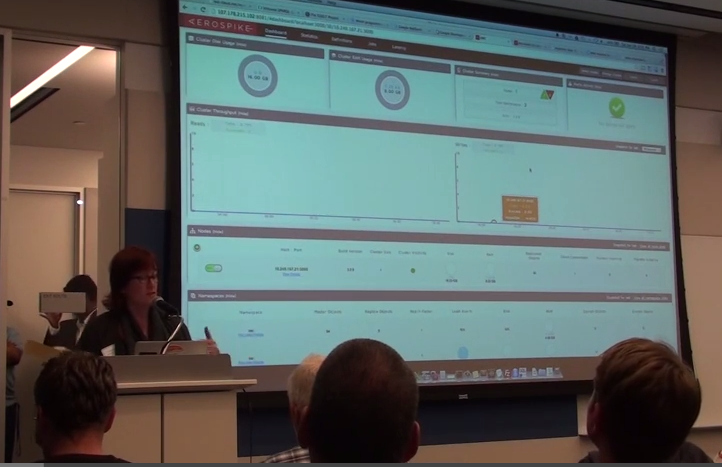 Here’s the live presentation, also I did a screencast of this presentation. 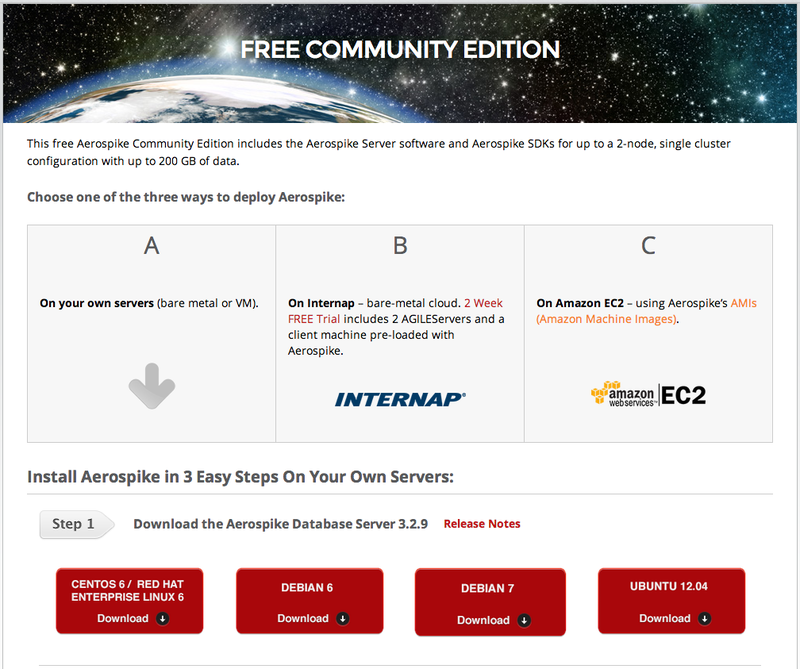 In this blog post, I’ll detail how you can get started with the FREE community edition of AerospikeDB. Again I’ll use Google Compute Engine as my platform of choice, due to the speed, ease of use and inexpensive cost for testing. You’ll note from the screenshot below, that you can install the community edition on your own server, or on other clouds (such as AWS) as well. 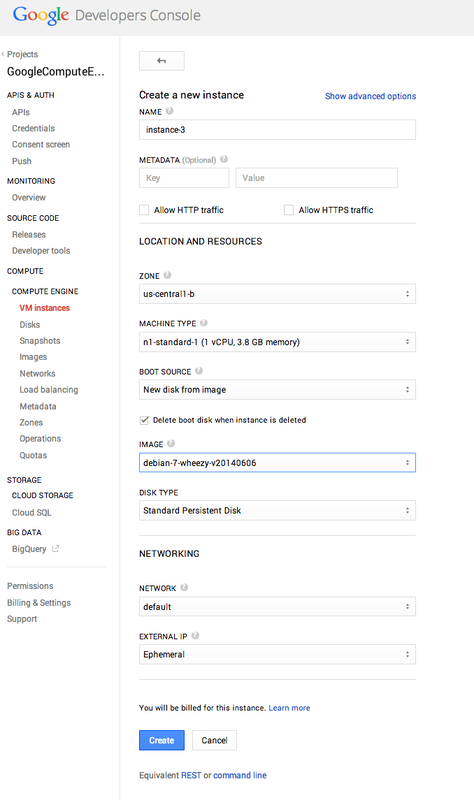 I am writing this blog post because Aerospike didn’t have directions to get set up on GCE available prior to this blog post. Here’s a top level list of what you’ll need to do (below, I’ll detail each step) – I did the whole process start-to-finish in < 30 minutes. Next I’ll drill into each of the steps listed above. I’ll go into more detail and will provide sample commands for the Google Cloud test that I did. If you are new to the Google Cloud, you’ll need to get the Google Cloud SDK for the command line utilities you’ll need to install and to connect to your cloud-hosted virtual machine. There is a version of the SDK for Linux/Mac and also for Windows. If you already have a Google Cloud Project, then you can proceed to Step Two. If you do not yet have a Google Cloud Project, then you will need to go to the Google Developer’s Console and create a new Project by clicking on the red ‘Create Project’ button at the top of the console. Note: Projects are containers for billing on the Google Cloud. They can contain 1:M instances of each authorized service – in our case that would be 1:M instance of Google Compute Engine Virtual Machines. To enable access to the GCE API in your project, click on the name of the project in Google Developer Console, then click on ‘APIS & AUTH’>’APIs’>Google Compute Engine “OFF” to turn the service availability to “ON”. The button should turn green to indicate the service is available. You will also have to enable billing under the ‘Billing & Settings’ section of the project. 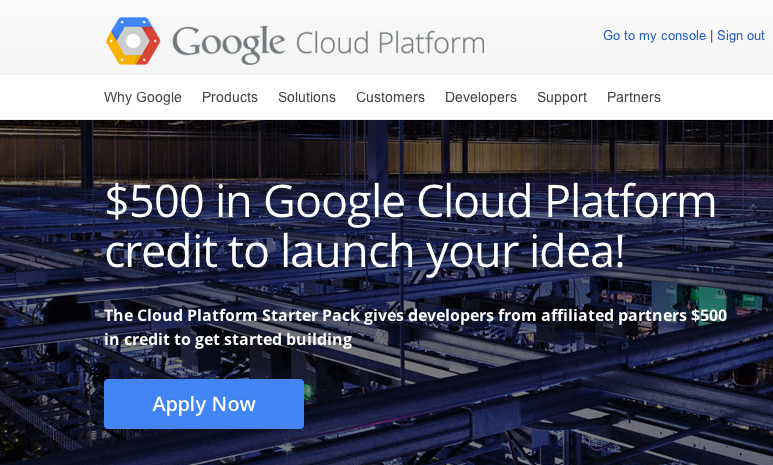 Because you are reading this blog post, you can apply for $ 500 USD in Google Cloud Usage Credit at this URL – use code “gde-in” when you apply for the credit. To be complete there are many other types of cloud services available, such as Google App Engine, Google Big Query and many more. Those services are not directly related to the topic of this article, so I’ll just link more information from the Google Cloud Developer documentation here. Note: All of the steps I describe below could be performed in the Terminal via GCloud command line tools (‘gcloud compute’ in this case), for simplicity, I will detail the steps using the web console. Alternatively, here is a link to creating a GCE instance using those tools. From within your project in Google Developers Console, click on your Project Name. From the project console page, click on ‘COMPUTE’ menu on the left side to expand it. Next click on ‘COMPUTE ENGINE’>VM Instances. Then click on the red button on the top of the page ‘New Instance’ to open the web page with the instance information as shown below. Also here’s a quick summary of the values I selected: ZONE: US-Central1-b; MACHINE TYPE: n1-standard-1 (1 vCPU, 3.8 GB memory); IMAGE: Debian-7-wheezy-v20140606. Other notes: You could use a g1-small instance type if you’d prefer, minimum machine requirements for the community edition of Aerospike are at least 1 GB RAM and 1 vCPU. You could use Red Hat and CentOS for the image, however my directions are specific to Debian 7 Linux. Click the blue ‘Create’ button to start your instance. After the instance is available (takes less than a minute in my experience! ), then you will see it listed in the project console window (COMPUTE ENGINE>VM Instance). You can now test connectivity to your instance by clicking on the ‘SSH’ button to the right of the instance. 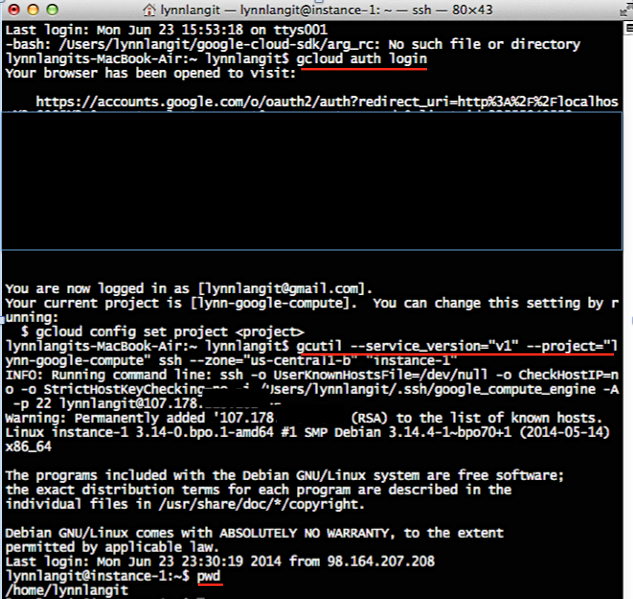 To test connectivity using SSH, open Terminal, then use the ‘gcloud auth login’ command as described previously, then paste the gcutil command into the terminal, an example is shown below. Notes: Be sure to run the scripts below as sudo. Also my install instructions are based on downloading the version of Aerospike Database Server 3.2.9 than is designed to run on DEBIAN 7. Next I setup a simple Node.js Client on the same instance as the server. The process is as follows: install Node.js and the Node Package Manager (NPM) and then install the Node.js Aerospike client package. These examples insert dummy data to a specified location in a similar fashion to the cli tool. 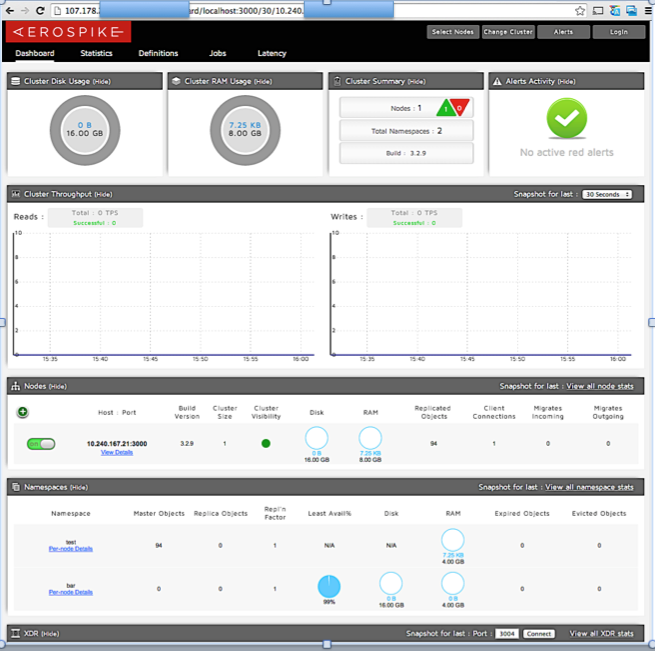 The Aerospike Management Console is a web based monitoring tool that will report all kinds of status information about your Aerospike deployment. Whether its a single instance or a large multi-datacenter cluster. To install the AMC I used the following script as superuser (e.g. sudo script.sh). Once deployed I pointed my browser to port 8081 of the instance. There will be a dialog asking for the hostname and port of an Aerospike instance. Since I installed the server on the same instance as the amc I just used localhost and port 3000. As mentioned, you can test Aerospike on up to 2 nodes. The next step I took in testing was to add another server node. Here are the steps I took to do this. # use the following 4 lines instead. In conclusion, I find Aerospike to be a superior performing database in its category. I am curious about your experience with databases of this type (i.e. In-memory NoSQL). Which vendors are you working with now? What has been your experience? Which type of setup works best for you – on premise (bare metal or virtualized) or in the cloud? If in the cloud, which vendor’s cloud. Also on the horizon, I am exploring up-and-coming light-weight application virtualization technologies, such as Docker. Are you working with anything like this? I will be posting more on using Docker with NoSQL and NewSQL databases over the next couple of months.